Within the pages of Michael W Larson’s new book, Refreshed In God's Word Volume 1, ($10.99, paperback, 9781498454384; $5.99, e-book, 9781498454407) readers will discover thought-provoking sermons that can be applied to the truths of their hearts and express them outwardly, showing people what it means to be a Christian. It is an essential book for those looking to further their walk with God – and an outstanding resource for anyone who needs some encouragement. The author considers himself as only a facilitator to God’s Word. All Biblical references that he uses in the book are from the King James version of the Bible. He recommends that all readers keep a Bible at hand, while reading the sermons for added understanding to the messages presented. Michael W Larson is a 25-year-old author from Anchorage, Alaska. He is a student at Fairhaven Baptist College in Chesterton, Indiana. Michael is a man that is continually pursuing after God's will, which concerns in his going to Capitol Hill, Washington DC as a missionary. Michael is currently staying busy in his studies of pastoral theology and music. He prays that all readers of his book will go and be refreshed in God's Word. Xulon Press, a division of Salem Media Group, is the world’s largest Christian self-publisher, with more than 15,000 titles published to date. 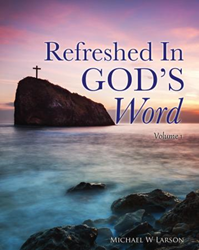 Retailers may order Refreshed In God's Word Volume 1 through Ingram Book Company and/or Spring Arbor Book Distributors. The book is available online through xulonpress.com/bookstore, amazon.com, and barnesandnoble.com.